At ChemicalInfo we know data. In fact our Data & Research team has made more than 40,000 updates this year alone to the DWCP! Check out the other updates and additions we have made to each of our products in the first half of the year. Remember, if you have a question concerning the data that ChemicalInfo can offer, please fill out a Pre-Sale Research Request form so that our in-house Research team can ensure we have the chemicals and company information you need to improve sourcing, sales and marketing efforts. The question our team receives the most often is, “How does your company ensure that your data is always accurate?”. The simple answer is that we have an incredible in-house research department that checks for data accuracy within listed company profiles and products every day. But what about the specifics? Let’s breakdown the Anatomy of a Company Profile. Company profiles include information like company name, phone, fax, email, company type (manufacturer, distributor, etc.) and the company description. This information is the first step in verifying listing accuracy and the ChemicalInfo Research Department uses the information to properly identify companies that can be listed in the Directory of World Chemical Producers (DWCP). As a company that has been around for 45 years we also have a vast network of global sales agents that are experts in their own countries that provide additional details and help bridge the gap when communicating to listed companies and contacts. We also use partnerships with trade shows as a source for meeting new companies and contacts as well as taking the time to meet existing contacts listed in the DWCP and receive feedback directly from those sources to make updates. Using a variety tools such as proprietary web crawlers, email testing with 3rd party tools and online sources the Research Department is able to continually monitor listed contact information. Company Locations are carefully vetted in order to ensure that company locations that are truly manufacturing products are listed and differentiated between other locations that may only be used for R&D, Sales and main headquarters. Profile certifications are an integral source of maintaining listing accuracy especially for manufacturers that hold government and regulatory approval certifications from entities such as the US FDA or EDQM. Third-party audit information provided by our partnership with Rx360 is also used as a determining factor to identify legitimate producers. Finally, ChemicalInfo’s partnership with Datamyne, a Descartes company provides subscribers with thousands of import/export records that help provide a complete picture of what commodities are produced, used and sold across the globe. Trade Data also provides key information that the Research Department uses to determine producer status by looking at export information. As a data company we take every possible measure to ensure all information offered in each of our products is accurate but the truth is no company can put a 100% accuracy guarantee on data. Every day mergers and acquisitions take place, new product lines are introduced, old products are discontinued, new finish form products receive government approvals, chemical professionals leave their company and begin new careers but at ChemicalInfo we have a fine-tuned process that provides subscribers data that can be relied on year after year. Ebola treatment centers in Liberia were forced closed after 508 medical professionals died treating patients in 2015. Of the approximately 1,000 patients treated in those centers, fewer than 300 lived. This I learned during the Keynote Speech at the Rx360 Annual Conference a few weeks ago. Rx360 is a consortium of pharmaceutical companies formed after the 2008 heparin recall. ChemicalInfo is honored to be a member of Rx360, whose mission is to protect patient safety and foster quality care. Former Acting US Surgeon General, who commanded the USPHS Monrovia Medical Unit during the Ebola virus outbreak, delivered the Keynote Speech and told the story of how the US government, with critical support from pharma companies and NGOS, squelched the Ebola outbreak. American diplomat, Gregg Starr, was speaking about the network of government agencies, private companies and NGOs that supported those traveling to Liberia after treatment centers were forced closed. The partnerships were already in place. 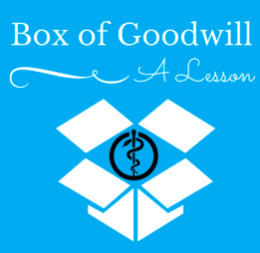 In a time of crisis, they did order a box of goodwill on demand and trust it was delivered—that the deathly virus had been stopped. I do not for one second compare what we do at ChemicalInfo to the heroic work of these medical professionals. They exemplify the very best of humanity—traveling into a highly contagious and lethal environment to save strangers. Still I think all business leaders can relate to Mr. Starr’s comment. When a crisis emerges and communities desperately need a box of goodwill, it is not the time to be looking for partners. I am so honored that ChemicalInfo has goodwill with great partners like Sendero, VAZATA, Datamyne, SOCMA, ChemSpec, Rx360, our global agents and others. They allow us to serve up goodwill to our customers at a moment’s notice. It’s that time again! Another round of PIERS trade data is available on even more company and product profiles in NextGen. As of today, hundreds of thousands more trade records are available to view (and download!) that include company and product specific details on import and export shipments, including weight and estimated value, equipping you with the information needed to make informed sourcing decisions. The history of import/export records in NextGen now expands the entire year of 2014, and we aren’t stopping any time soon. About PIERS PIERS is the most comprehensive database of U.S. waterborne trade activity in the world providing information services to thousands of subscribers globally. Launched more than 35 years ago, PIERS was the first venture in digital global trade intelligence and quickly became the industry standard for accuracy, reliability and insight. Our unique infrastructure and proprietary technology allow us to not only publish import data, but also complete coverage of U.S. export transactional data. PIERS is a division of JOC Group Inc., and a sister company of The Journal of Commerce. For more information about customized solutions from PIERS, visit www.piers.com. About JOC Group Inc. The JOC Group Inc. is the authoritative provider of business intelligence, data and events for trade, transportation and logistics professionals worldwide. Through its PIERS database and leading JOC coverage of transportation online, print and events, the JOC Group Inc. provides customers with critical insights, data-rich intelligence and tools to compete effectively in the global marketplace. For further information, please visit www.joc.com/group. About ChemicalInfo Chemical Information Services was established in 1972 and began as a publisher of chemical supplier data that was sold on an as-needed basis. 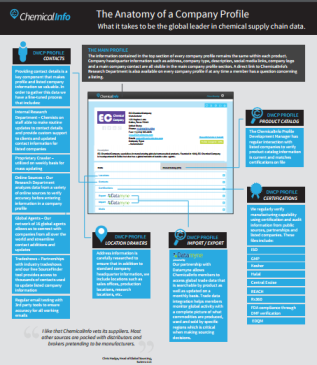 This quickly morphed into a high demand for something formal to be compiled and distributed to chemical and pharmaceutical companies across the globe, making ChemicalInfo a one-stop shop for chemical sourcing needs. ChemicalInfo has partnered with an outstanding systems integration and UI firm to work on the redesign and consolidation of its databases. This seven month project kicked off on January 15th, 2014, and enhancement expectations include an entirely new user interface, more robust chemical and producer information, and a more efficient internal system for making updates to the database so that the ChemicalInfo team can properly utilize its resources. For more information, visit www.ChemicalInfo.com. Drug delivery has been an avenue for innovation in the drug development industry for decades. Initial improvements focused around delivering medicine with the maximum efficacy and safety in a form accepted by patients, leading to greater patient compliance. At the time, the potential financial impact of drug delivery technology wasn’t appreciated and therefore couldn’t sway Big Pharma’s focus from finding the next blockbuster. As a result, specialty pharmaceutical companies took up the mantle and began to offer the service while Big Pharma retained its focus. This resulted in partnerships with benefits for both parties when it became clear that improved drug delivery boosted therapeutic potential and that experimentation with delivery forms could lead to additional therapeutic indications, providing a different facet of innovation. As the need for drug delivery innovations specific to biologics unfolds, we can anticipate a new type of relationship emerging. Over the past ten years, a number of contract research and contract manufacturing organizations have added drug delivery technologies to their service offering. It makes sense for manufacturers to be concerned with improved delivery as it helps to reduce wastage of valuable therapeutics. Whether in the form of overfill, disintegration or lack of absorption, a reduction in the required dosage increases profit margins for manufacturers. In addition to the benefits inherent to manufacturing, proprietary delivery technology can cement customers into long-term relationships. Looking to 2013, there is a steady demand among buyers of outsourced services for drug delivery support. Results from the Nice Insight Pharmaceutical and Biotechnology Outsourcing survey show that one in five plan to outsource a drug delivery project in the coming year. Big Pharma comprises the largest segment of drug delivery outsourcers at 42%, followed by Biotech (23%), Specialty Pharma (16%), Emerging Pharma (12%) and Emerging Biotech (7%). Considering the challenges inherent to delivering biologics-based therapeutics, it isn’t surprising that four out of five who outsource drug delivery are engaged in the development of biologic-based therapeutics. The development of biologics-based therapeutics drives the need to consider drug delivery technology earlier in the development cycle, which was reflected in research results in several ways. These outsourcers supported a growing trend among biopharma companies, which is to engage outsourcing partners earlier in the development lifecycle. More than half (55%) of drug delivery outsourcers agree it would be valuable to use the same delivery form from early phases through the development cycle. Also, when respondents were asked specifically which companies they would consider when outsourcing a project, CROs held two of the top three positions. Respondents selected Boehringer Ingelheim, Covance, ICON and Baxter BioPharma as their top four choices when outsourcing drug delivery. There was a three-way tie for fifth between AAI Pharma, Alkermes and Catalent. The top CMOs mentioned by respondents—Boehringer Ingelheim and Baxter BioPharma—received “excellent” scores for quality and reliability, which are the two most important outsourcing drivers according to this group. However, these two companies were perceived as less affordable compared to CROs, Covance and ICON. Among CROs that offer drug delivery services, Covance and ICON received the highest quality and reliability scores of the group. Yet, interestingly, the CRO companies received their highest scores in productivity and regulatory compliance. This suggests that different criteria are driving drug delivery business to CMOs (quality and reliability) and CROs (productivity and regulatory history). As the outsourcing model evolves towards more strategic partnerships, where biopharmaceutical companies are looking to CROs and CMOs in order to access specialty skills as well as improving quality, it makes sense for these contract providers to expand their service offering to include drug delivery. The results will likely be mutually beneficial to the drug developer and contract organization, helping each of them to maximize their resources. Survey Methodology: The Nice Insight Pharmaceutical and Biotechnology Survey is deployed to outsourcing-facing pharmaceutical and biotechnology executives. The 2012-2013 report includes responses from 10,036 participants. The survey is comprised of 500+ questions and randomly presents ~30 questions to each respondent in order to collect baseline information with respect to customer awareness and customer perceptions on the top 100+ CMOs and top 50+ CROs servicing the drug development cycle. Over 900 marketing communications, including branding, websites, print advertisements, corporate literature and trade show booths are reviewed by our panel of respondents. Five levels of awareness from “I’ve never heard of them” to “I’ve worked with them” factor into the overall customer awareness score. The customer perception score is based on six drivers in outsourcing: Quality, Innovation, Regulatory Track Record, Affordability, Productivity and Reliability. are generally company founders, present owners, executives and other key employees. Occasional participants are line employees, suppliers and at last but not at least, customers who are willing to share their own experiences with the company or product. This includes successes, challenges or simply thei stakeholders aspirations and suggestions for the future. It is particularly important to include in the process not only long-time customers but also lost customers in order to capture the full emotional picture surrounding the company, address the negatives and build on the positives. Stage 3: Delivering the brand strategy document In the initial stages, the agent’s role is to facilitate these group discussions, lead interviews, gather information and manage the whole project against the budget and timeline. Eventually, the role of the agent evolves into identifying and highlighting similarities while unveiling several potential emotional connections to the intended positioning of the brand. All this work will eventually generate a several page document called “the brand strategy document”. The brand strategy document ultimately provides the strategic groundwork for the brand image and positioning. Once the brand team agrees on the new brand positioning, it needs to have the reality check against market size, key market segments, intensity of competition and customer hierarchy values. The proposed brand positioning must also resonate with the business environment in order to be profitable2. If the market size is large enough, the intensity of the competition reasonable and the new brand positioning relevant to the customer, the branding project can be handed over to the Creative Agent for concept Development. The brand strategy document has several building blocks that will eventually end up being used in various marketing communications documents. Here are the main building blocks: a. The organizational history The history of the organization is critical for understanding the trajectory of the business from its inceptions to the present moment. The milestones related to organization past successes and challenging moments would reveal the values and the culture of the business. The history of the company included in the branding exercise will give the brand meaningful continuity, and increased credibility in the market place and with the company employees. b. Key business messages It is equally important to consider past marketing and PR messages. This effort gives an idea for the content, voice and tone of the existing brand (if any), and also correlates with historic sales outcomes, which is helpful for pro-forma projections. The accent falls on the most recent messages, their alignment or possible connections with the intended branding objectives highlighted above. c. Perception of past messages If the budget allows, it is informative to see what was the perception of past messages by key stakeholders, their likes and dislikes and to what degree the intended effect has in fact been achieved. A gap between the intended key messages and their perception and retention can provide useful insights in the way the target audience acquires information, thinks and absorbs the brand. d. Profile of target audience The background of the target audience is important for the branding project. For example certain symbols might have geographically restricted significance. This is important if the company intends to operate in international markets. The education, age and functional position are also highly relevant. By way of example, in the case of a company that is relying on a new product line the target audience will be R&D types who are generally early adopters in customer organizations. On the contrary, a company that is basing its growth plans on gaining market share for existing products must target their brand mainly to corporate purchasers. And yet again, for a company where the moral of the employees is low, branding must respond to their aspirations and concern. The logo, the tag line and all other elements of the brand might be completely different in these cases. e. Competitive mapping Brands do not exist in vacuum; they compete with other brands for the attention of the target audience. The brand positioning exercise needs to take into account the existing competitive landscape in order to create a brand identity that is distinctive amongst competitors and simultaneously relevant to the target market. For example the agent in charge with branding could generate a list of key messages of main competitors by interviewing customers and reviewing their market communications. Based on the information garnered from stakeholders and secondary sources (print and digital) the brand strategy document must ultimately spell out the following deliverables: • Brand story: documents in an inspiring way the social benefits provided by the organization along the years • Brand core values: highlights the spiritual backbone that helped the organization overcome vicissitudes and reach meaningful objectives above and beyond financial ones • Brand attributes: show what are the most appealing aspects to the main stakeholders, employees, customers and owners • Brand vision: an inspiring description of how the organization or product will fit in a progressive future • Brand mission: a short, mobilizing call to action anchoring the focus of the company for the long term • Brand promise: describes what are the functional and emotional benefits to stakeholders • Brand tag line: a catchy short statement summing up the vision, the mission and core values • Brand positioning: shows what distinctive place should occupy in the minds and hearts of the target audiences relative to other competing brands The brand strategy building blocks and deliverables are presented in a schematic form in Figure 2. Figure 2. The brand strategy document. It is important to note that there must be a logical alignment between the deliverables of the branding project. Although the organization might never fully reach any of these deliverables, the management must work towards creating an organizational culture and structure that supports the corporate brand. Stage 4: Concept development Once the brand team agrees on the brand strategy document and arrives to the list of deliverables, the process moves to the concept development stage. The creative development stage has a single clear purpose: translate the brand strategy content in an emotional experience. ABSTRACT The total value delivered to the customer is the sum of “what” is being delivered (the product itself) and “how” it’s being delivered (collaboratively, reliably, on-time, post-purchase service etc.). Branding activities is shorthand for trust. As such, branding is part of “how” the value is delivered to the customer. Branding is a minor cost to the manufacturer but delivers significant value to the buyer. When it comes to branding, Western small and medium size companies (SMEs) should have an inherent competitive advantage over low cost manufacturers. By increasing the customer delivered value through branding, Western companies can partially compensate for their structural cost disadvantage embedded in the “what” component. The article explains in the first part why branding renders Western manufacturers more competitive in the global market place. In the second part (published in the next issue) the article will provide a practical branding process for SMEs. INTRODUCTION “To be, or not to be: that is the question: Whether ’tis nobler in the mind to suffer The slings and arrows of outrageous fortune, Or to take arms against a sea of troubles, And by opposing end them?” Shakespeare, Hamlet 3/1 For many owners and executives in the Western fine chemical industry the Shakespearean monologue rings increasingly true in the globalization context. The Western fine chemicals industry is under siege. A combination of adversary drivers such as cost structure, flat demand and enormous price pressure in their home markets are creating the perfect storm conditions. While the problems are obvious, the question remains: what “arms” should they use against this “sea of troubles”? This article shows that the SMEs unique focus on delivering the tangible chemical product fails to acknowledge the sustainable competitive advantage that Western chemical enterprises have over low cost competition at the INTERFACE with the customer. The total customer delivered value does not reside only in the physical product. The delivered value to the customer is the sum of the product (The What) and all the activities at the interface between supplier and buyer (The How) (1) as suggested in equation 1): Equation 1: CUSTOMER DELIVERED VALUE = WHAT YOU MAKE+ HOW YOU DELIVER The “What”, the product itself, is essentially a CAS number. Unless you have a proprietary molecule, what you make is by definition undifferentiated from a supplier to another. Process patents continue to provide weak protection in low cost countries so having good processes can provide only a fleeting cost advantage. Moreover, it is anticipated that low cost producers will continue to keep their structural cost advantage (2) for the foreseeable future. Under these circumstances, activities taking place at the interface between the supplier and the buyer (“The How”) are in fact the only activities that can provide Western companies with a sustainable competitive advantage. This is why Western companies in the fine chemicals industry should invest in interface activities in order to compensate for their lack of competitiveness on the cost side. A small incremental cost in interface activities could increase considerably the value delivered to the customer while providing an attractive return on investment for the SME. TO BRAND OR NOT TO BRAND: A FALSE DICHOTOMY Branding is one of many activities that belong to the manufacturer interface with the customer. Essentially a brand simplifies the supplier/customer interactions through trust. As such, building the brand can be an important part of creating “The How” component of the customer delivered value. Most of the low cost suppliers do not even have the notion of what a brand is let alone the capability to build a brand. Since branding done right provides considerable customer value at a reasonable cost, this means that there is great scope for branding in terms of gaining market share from other competitors from all over the world. For example, considerable effort is undertaken by purchasing to identify, evaluate, qualify, negotiate, communicate, and collaborate with a supplier. It is undoubtedly much easier for the buyer to skip these tasks by working with a company that has invested in positive brand associations and lived up to its brand promise time and again. In another example, R&D scientists are making critical decisions every day in terms of choice of raw materials and synthetic routes. They are deciding therefore the future consumption of large corporations for many years to come. A SME that makes the information available, increases awareness for its technical solutions and provides support during the development process builds the reputation of a respectable brand and gains the scientists trust. Unfortunately, there is a misperception that a brand is the prerogative of large companies only. Usually SMEs do not have budgets dedicated to this activity. In reality, due to the low level of branding effort in the fine chemical industry, a small investment in branding activities can quickly establish any SME’s market niche leadership. We make the argument that branding is one of the activities that chemical SMEs cannot afford to skip. In fact, a SME that has nothing to say about how it is going to provide customer beyond delivering “the what” is acknowledging indirectly that the company is competing on price. Without a minimal branding effort, these SMEs are simply selling a physical product, an undifferentiated CAS number. It is no surprise that such suppliers will invariably end up being benchmarked against low cost competition. CONCLUSIONS: The value delivered to the customer is the sum of “what” is being delivered (the product itself) and “how” it’s being delivered. Branding is shorthand for trust. As such, branding is part of “how” the value is delivered to the customer and creates customer delivered value. The lack of branding activities is wrongly perceived as a simple cost cutting measure. The first part or this article makes the argument that a buck saved in the short term is a buck not invested in a profitable branding project. In fact, lack of branding from the marketing mix fails to create customer value and capitalize on a small incremental cost for the supplier. Most of the Western chemical SMEs fail to recognize the inherent competitive advantage they have in branding for the Western markets. This is one of the points where Far East producers will continue to struggle in the near future. Making the deliberate choice to forgo branding activities, Western SMEs implicitly focus all business conversations on the product itself thus playing to the advantage of their Far East competitors. The second part of the article provides a practical “How to” on the branding process. It should help SMEs execute the branding process with limited internal resources at minimal cost. MarketChemica offers specialized marketing services to the global fine and specialty chemicals industry. For more information see marketchemica.com. ” REFERENCES AND NOTES 1. N. Dawar, Chemistry Today, 29(1), (2011). 2. P. Pollak, A. Badrot et al., Contract Pharma, Jan/Feb, (2012) this article documents that the inherent difference in the cost structure between Western and Far East countries will continue to be significant within the strategic horizon timeline. Required use of a firm-wide corporate card that is connected to an automated expense reporting system. Service or benefits such as free breakfast and internet that result in additional cost savings. The use of an online booking tool that incorporates a firm’s travel policy and preferred vendor relationships can generate annual cost savings in the 5 to 8% range. Required use of a firm-wide corporate card connected to an automated expense reporting system allows for tracking of employees’ expenses at a line item level and limits questionable expenses (i.e., car upgrades). In our prior client experience, companies conducted infrequent audits of their travelers’ expenses (less than 1 in 1000 reports) due to the sheer volume of reports or an inability to easily see line item level details. However, the recommended program of a corporate card paired with policy-driven automated expense reporting system with increased auditing (1 in every 300 reports) can generate savings of 1-3% savings when properly implemented. All of these elements, when combined together into a well-built travel program, can produce significant cost savings but as we have seen from a recent client, the lack of organizational will to fully implement any of these three components can deteriorate savings. The client chose to limit the audit and compliance ability of their program, resulting in a 11% reduction from estimated savings. Their decision to let travelers book hotels outside of the online booking tool for cities outside of its top 30 cities by spend further reduced potential savings by another 10%. What this demonstrates is along with the key components mentioned above, a company needs to fully implement all key components in order to realize the full benefits of cost savings from a world class travel program.